Exrension to hand thread cutting tools. Inside and outside square of identical size. Length - 125m..
Extension to hand thread cutting tools. Inside and outside square of identical size. Length - 125m..
Ruko Ideal for Thread Cutting in Inaccessible areas. With 2 Jaw Chuck for Tensioning Square Shanks..
Set Includes 3 of each taps from M3 to M12..
3 Taps per each set. 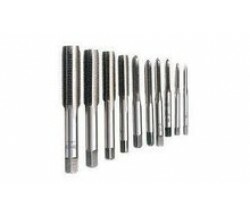 M3, M4, M5, M6, M8, M10 & M12 1 x Tap Wrench.. Pitch - 1.5mm Thread core hole - 8.5mm Total length - 70mm Thread length - 24mm The single cut..
Scott High Speed Steel Ground Thread Taps Set Includes - Taper, Second & Plug..
Ruko Type B, 4 - 5 Threads with Progressive Ta.. Pitch - 1.75mm Thread core hole - 10.2mm Total length - 75mm Thread length - 29mm The single c..
Ruko Type B, 4 - 5 Threads with Progressive Tap..
Trubor Type B, 4 - 5 Threads with Progressive Tap..